Shipping weight: 8 lb 2 oz. Superior in Quality to All Others - You Pay For What You Get! This "Propeller Line Guard" is designed for the serious boater or fisherman. Will protect propeller and skeg from damage in shallow water. Ideal accessory to keep lines and downrigger wires away from propeller. 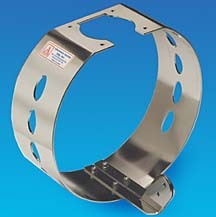 4" wide stainless steel band complete with "Pressure Relief Ports" to enhance performance. 10 gauge heavy duty protection for propeller. Also increases efficiency of propeller. All stainless steel mounting hardware included. Entire unit electropolished for extra long life. Nine sizes from 7" to 16" propeller diameter. Important: Check with your insurance company, an Adventure Marine propeller line guard may qualify for an insurance premium reduction! Don't compromise with plastic guards that bend, flex & break. Go with our stainless steel products that will last forever! Constructed and independently tested to perform under extreme sea conditions. Prop guards may become mandatory in the U.S. Be safe, be proactive, act now. Used by Coast Guards and Military worldwide. Now available for all your boating needs too. On today's busy lakes, rivers and waterways littered with debris and with rocky bottoms, a propeller guard is an exceptional security feature and an inexpensive way to protect your propeller, engine and boat from damage and high repair bills. A broken propeller on rough seas can be a very dangerous predicament! Water skiers and water sport enthusiasts, the Safety Guards can help be a "lifetime" of safety and proactive protection against accidents, injury, death and/or lawsuits. Insurance companies love this product and so will you! Protect yourself, your family, your friends and your assets now! Boaters and fishermen, the Line Guards can save you $ in new props from hitting bottom, and save time in untangling line, downrigger cables and gear from your propeller and save money in lost fishing tackle! The actual propeller diameter in not the accurate measurement for the guard selection. Please refer to chart and sizing diagram and information below to determine the accurate measurement for correct Guard selection. Note: Adventure Marine Propeller Line Guards are constructed and independently tested to perform under extreme sea conditions in accordance with Coast Guard/SOLAS regulations. To select correct guard measure the distance from under the anti-cavitation plate to the bottom of the skeg. See “A” on drawing. If this distance measures 12”, the Guard diameter should be 12”. Select: Model 91112 Safety Guard or Model 91112-4 Line Guard. The propeller diameter is always less than the distance from under the anti-cavitation plate to the bottom of the skeg, usually at least 1” to allow for ½” clearance below anti-cavitation plate and ½” above the bottom of the skeg. To select Guard size by propeller diameter only is not recommended. The above mentioned example is the correct selection guide. **Important: Check with your insurance company, an Adventure Marine propeller safety guard may qualify for an insurance premium reduction! Q: Will the Propeller Safety Guard fit my motor? A: We make 9 sizes for propeller diameter 7” to 16” in 1 inch increments. Guard diameters are 9” to 17”. Q: How much will the Guard cost? A: Prices depend on size. Q: What material are the Guards made of? A: From solid stainless steel and stainless steel wire mesh (subject to which model). Electro-polished for long life and pleasing appearance. Q: How is the Guard mounted on the motor? A: The upper mounting plate of the Guard is 10 gauge stainless steel with a center opening to accommodate the anode. Four (4) 5/16” diameter holes pre-drilled for mounting the guard under the anti-cavitation plate. Four (4) ¼” stainless steel cap screws and lock nuts secure guard to anti-cavitation plate. The lower mounting brackets (2) attach to the bottom of the Guard, one bracket on left side and one bracket on right side of skeg. Two (2) ¼” stainless steel cap screws with lock nuts attach brackets to skeg. Four (4) stainless steel ¼” cap screws and lock nuts attach brackets to lower section of guard. In the lower section of the guard is a long-gated slide attachment to allow fore and aft adjustment to find proper location on skeg to fasten brackets. A: An electric hand drill with a 5/16” high speed drill bit and 2 open end 7/16” wrenches. Q: What benefits will I get from the Safety Guard? A: Protection for swimmers, water skiers, divers and other persons in the water around the boat. Also protection for sea-life such as Manatee’s. A must for rescue boats, Police and Fire Department Inflatables, Rental house boats, boat rental fleets, pontoon boats and many other applications. Q: How much friction or drag will the Guards cause? A: Depending on speed and motor/hull configurations, from 3% to 5%. At slow speed to medium speed very little, at high speed more. Q: May I return the product of not satisfactory? Q: What benefits will I get from the Line Guard? A: The guard will keep fishing lines and downrigger wires away from propeller. The Guard will keep more solid water around propeller and increase efficiency. The Guard acts as a rudder and will give improved steering especially at low speeds. The Guard will protect skeg in shallow water. The stainless steel brackets mounted to both sides of the skeg will re-enforce skeg. The Guard will protect propeller from getting damaged. The Guard will allow you to make tighter turns with less “sideway slip “. The Guard will prevent expensive repairs to skeg and propeller. Protecting humans from a rotating propeller on pleasure boats is difficult. Whatever apparatus is used will affect the performance of the boat, especially speed, to a certain degree. Most responsible boaters will accept this small reduction in speed for the benefit of the safety factor. A reduction in top speed of approximately 5% was recorded in test-runs using a 16' runabout with a 75HP outboard motor. 1. An outboard motor running at 3200 RPM equipped with a 3-blade propeller, the propeller will strike an object 160 times per second. 2. A boat moving forward at high speed, will first impact with a body by the lower unit of the motor possibly causing fractures to limbs. Serious injuries could be caused by the rotating propeller blades outer edges. 3. A boat moving astern at slow speed can cause serious injuries to the human by the rotating propellers full rear surface. 4. A human striking a moving propeller in a 90 degree angle in relation to the centerline of a boat or being struck by the skeg on the outboard motor from below. 5. The rear 180 degree propeller angle clearly presents the most dangerous area of the boat propeller to humans. This is not only a major concern to pleasure boaters, but also ski boats, dive boats, rescue boats, boats with children on board and rental boats plus many other boating activities. In summary, the unprotected propeller of an outboard or inboard /outboard motor is a major hazard to humans. Many serious injuries and fatalities attest to this fact every boating season. The Series 9000 Propeller Safety Guards have been designed in an effort to reduce injuries and to provide a reasonable degree of protection. "I'd like to extol the value and merits of your prop guard product. I called recently to order my second one. 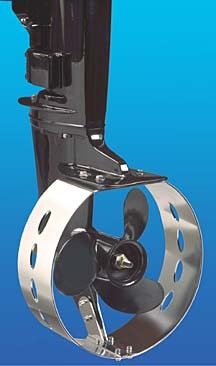 I have one on my 50 horse pontoon boat, now I'm ordering one for my 15 horse Mariner on my 14 foot Grumman fishing boat. The guard paid for itself 4 times over last summer. I can't wait to get one on our small boat before my two sons hit the water again this year. The guard is about the same price as the blade on my outboard, so it'll pay for itself the first rock my son finds in our river. They go on easy, stay firm and I really feel my motor is protected. I don't know why you haven't sold one of these for every boat yet. Don't worry, when word gets out, YOU WILL! "This guard paid for itself 4 times over last summer." Attached you'll find a picture I took recently of the guard on my 50 horse 4 cycle. It's in a foot of snow in our back yard. It's winter here now, but it'll warm up soon and it'll be back in the water then. The prop guard covers the blade all four seasons here at our house and this picture shows it." "Thanks I received the guard yesterday. It looks great! I hope to install it in the next couple of days. Good to see PRIDE OF CRAFTSMANSHIP IS NOT DEAD." "I have a Yamaha 9.9 HP, 4 stroke high thrust trolling motor on a 24 foot aluminum cabin cruiser. The prop is currently uncovered and I just ate another downrigger line in a high wind today. I would like to guard the prop as this is the fourth time I've wound line." "I only lost about 4mph on top end (25mph to 21mph) and it's already saved me 2 props! Thanks."